The Great Lakes Loons rallied for six runs in the bottom of the 9th inning to tie the Lake County Captains 10-10 at the end of regulation play, and went on to win in the 10th on an RBI single by Darien Tubbs, who homered earlier in the Thursday game. Even more impressively, the Loons scored all six of their 9th-inning runs with two outs. Captains reliever Jon Fitzsimmons struck out the first two batters he faced, then walked the next four before being replaced by Devon Stewart on the mound. Stewart promptly gave up back-to-back homers — a grand slam by Omar Estevez and a solo shot by Luke Raley — before striking out Brendon Davis to end the inning. The Loons scored 10 of their 11 runs in the last four innings (two in the 7th, one in the 8th, six in the 9th, one in the 10th). Lake County’s Sam Haggerty went 4-for-5 with a double. Anthony Miller hit a two-run homer for the Captains. 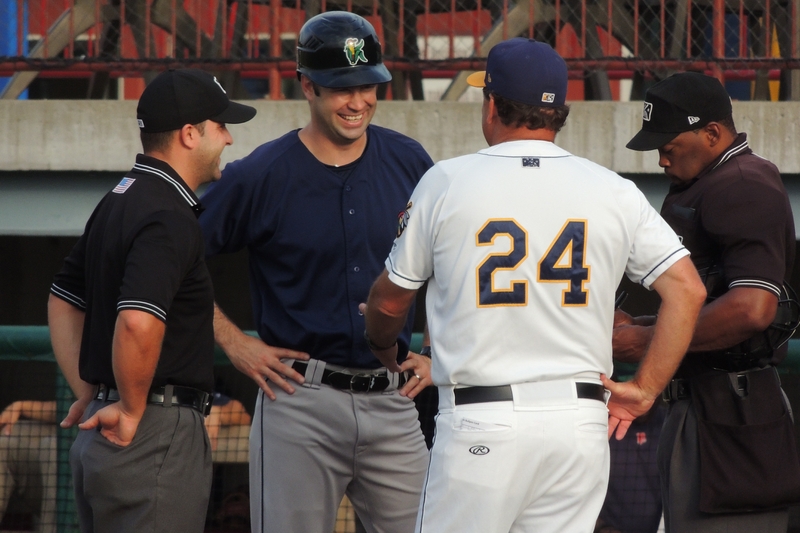 The Cedar Rapids Kernels beat the Kane County Cougars 2-0 Thursday to give Jake Mauer his 300th win as the team’s manager. Kernels RHP Eddie Del Rosario scattered four hits and a walk while striking out eight over five scoreless innings. It was Del Rosario’s third scoreless start against the Cougars this season. This entry was posted in Burlington Bees, Cedar Rapids Kernels, Great Lakes Loons, Kane County Cougars, Lake County Captains, Midwest League. Bookmark the permalink.